Nobody could ever accuse the Decemberists' Colin Meloy of opting for the path of least resistance: since 2005's baroque masterpiece Picaresque, his Portland-based quintet have ploughed an increasingly prog-fixated furrow, often seeming to extract a perverse glee from revelling in the abstruse and portentous. With their last album The Hazards of Love they appeared to have arrived at something of a creative cul-de-sac: the album's flashes of undeniable brilliance too often obscured by overwrought bluster, muddled conceptual ambitions and a chronic lack of focus. In spite of its characteristically grandiose title, follow-up The King is Dead represents an attempt to get back to basics. It's a record of refreshing vitality and economy, clocking in at a lean 40 minutes and taking as its template the lo-fi urgency of Murmur-era REM. So in thrall is this record to the Georgian rockers that Peter Buck himself even pops up on a number of tracks – contributing his trademark arpeggiated guitar to 'Calamity Song', a shimmering folk-pop gem which builds stealthily into a giddily euphoric coda. Lead single 'Down By The Water' even invokes the spirit of 'The One I Love', Americana icon Gillian Welch joining Meloy on a broodingly intense rock anthem to dislocation. The sense of stripping things down to the bare bones isn't just confined to the music, either: lyrically also, there is a move away from the florid, fantastical third-person yarns of yore to something more intimate and plaintive. And whilst initial impressions may lead the listener to suspect that a little of The Decemberists mystique and roguish charm has been lost in the process, repeated exposure to these understated melodies helps allay such fears. Meloy's charismatic drawl helps give a crisp potency to harmonica-flavoured opener 'Don't Carry it All', while his penchant for elliptical historical references rears its head on trad-folk barnstormer 'Rox in the Box', a rueful lament about the betrayal of the mining community of Butte, Montana in the early 20th century. A couple of achingly pretty seasonal ballads – 'January Hymn' and June Hymn' – capture the band at their most disarmingly poignant, the wistful reverie of the lyrics and fragile vulnerability of the vocals recalling After the Gold Rush-era Neil Young. 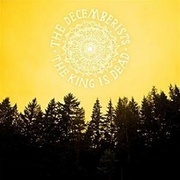 Despite the album's presence at the top of the US charts, it would be glib and unfair to label this record a pitch for mainstream acceptance: a band as wilfully anachronistic in vision as The Decemberists could never sit comfortably alongside the conformist and smugly self-satisfied new folk set. Even at their most sure-footedly anthemic, such as on penultimate track 'This is Why We Fight', there is a freewheeling romanticism and subversive spirit which elevates this above more humdrum fare. The King is Dead sounds not so much like a strategic retreat as a consolidation of previous achievements, their gift for rambunctious melodrama and soaring melodies enhanced by the presence of a hitherto untapped quality: subtlety.